It’s that time of year again! With the busyness of the Christmas season, we need to be preparing an effective mailing of annual giving statements for January. Elevating the giving conversation in your church by saying thank you to your givers is huge. Don’t miss this natural moment to invest into the spiritual life of your people. It’s worth the focus and the work to demonstrate a spirit of gratitude! As you prepare this annual communication to your givers, there are two main ideas I encourage you to consider: the mailed statement itself, and how you communicate directly to your people on the weekend. Let’s take a look at both of these to help you get this off the ground and running! Use a church envelope so the recipient quickly realizes this mailing is from you. This will increase the likelihood it will be opened right away. Include a statement showing the giver’s giving data for the last year. Use a large, colorful, first-class stamp for this mailing. Envelopes using this kind of postage are opened at a much greater rate than metered mail. A version of your mission statement, but generally not the actual mission statement that is often written in business language rather than faith-inspiring words. One brief story of a person to personalize the ministry and mission. A reference to the exciting quarter or year ahead. An affirmation of the spiritual value in their intersected faith and finances. An alert to read their enclosed statement. A relational affirmation to conclude. The week before the annual statements go out in the mail, we’ll want take two or three minutes within the worship service to alert people to watch their mail and to highlight the statement. The time around the offering is a natural place to make this work. This can be accomplished via video or live announcement. Saying thank you to your givers. Normalizing the conversation of faith and finances in a small way that will help to craft the larger spiritual value of giving. Telling a brief story of how your church has made a difference this week. Alerting people that the statements are coming soon. Asking the people to open and to interact with the communication that comes this week. 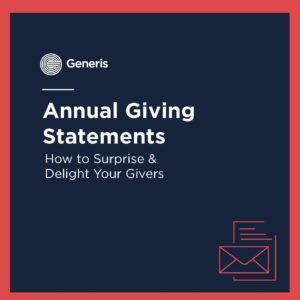 Generis has created a resource to help you surprise and delight your givers through their newest e-book called 2016 Annual Giving Statements Guide. And it’s available for your free download today! Please use this resource to frame your work. This e-book will walk you through several important steps to engage with your givers on a new level this year. Engaging them like this opens their hearts and develops deeper roots in their church engagement.